Talmudist and Biblical commentator of the seventeenth and eighteenth centuries; died at Constantinople Aug. 9, 1732. He belonged to an exiled Spanish family, and was the grandson and pupil of Moses ibn Ḥabib. He edited various important works. The first fruit of his literary activity was the publication of his grandfather's writings. To this end he left Safed, where he seemed to have taken up his abode, and removed to Constantinople. As he points out in various passages in his writings, he found in Ḥayyim Alfandari the Younger a warm supporter. While engaged on the works of his grandfather, he entered (1714) into close relations with the chief rabbi of Constantinople, Judah Rosanes, at the time generally regarded the highest authority of the Orient. Rosanes appointed Culi dayyan, which, together with his position as teacher, secured to him a sufficient livelihood. In 1727 Culi published his grandfather's work "Shammot ba-Areẓ" (notes on various portions of the Talmud), with an index. In this year Rosanes died. He left voluminous literary remains in a very chaotic condition. To introduce order into this chaos it needed a scholar of the first rank. With this task Culi was entrusted. But even for him it meant a labor of several years. First, in 1728, he edited the "Parashat Derakim," a work both haggadic and halakic. Three years later he published the voluminous "Mishneh la-Melek," enriched with numerous important notes. To both these works Culi wrote a preface. In the same year, he edited also his grandfather's "'Ezrat Nashim," in the beginning of which there are two responsa of his own. His most important work is his commentary on the Pentateuch, entitled "Me'Am Lo'ez." This work, which is held in high regard by the Jews of the East, is a very elaborate encyclopedic commentary in Ladino, dealing with Jewish life in all its relations. Its material was taken from the Talmud, the Midrash, and the principal works of Talmudic and rabbinic literature. Culi carried his commentary on the Pentateuch through Genesis and as far as ch. xxiv of Exodus. After his death the work was continued by Isaac Magreso and Isaac Behor Arguiti. 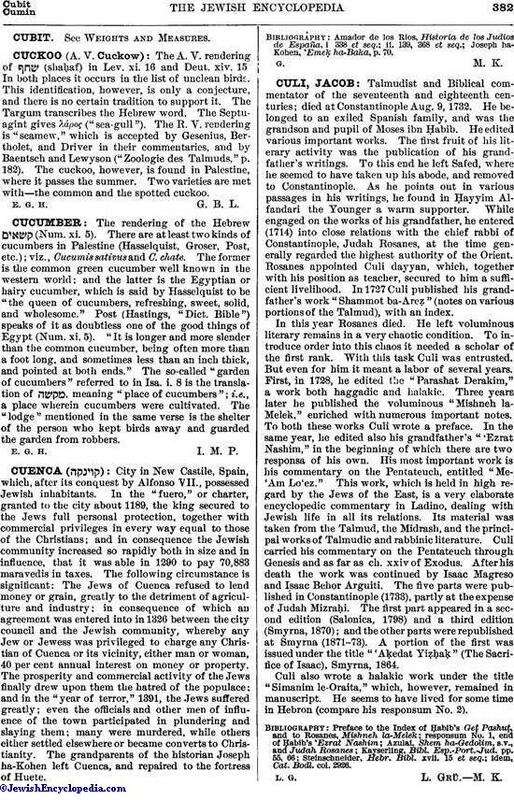 The five parts were published in Constantinople (1733), partly at the expense of Judah Mizraḥi. The first part appeared in a second edition (Salonica, 1798) and a third edition (Smyrna, 1870); and the other parts were republished at Smyrna (1871-73). A portion of the first was issued under the title "'Aḳedat Yiẓḥaḳ" (The Sacrifice of Isaac), Smyrna, 1864. Culi also wrote a halakic work under the title "Simanim le-Oraita," which, however, remained in manuscript. He seems to have lived for some time in Hebron (compare his responsum No. 2). idem, Cat. Bodl. col. 2926.